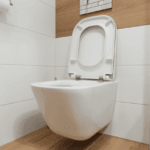 Although you have probably tried to buy the best toilet in the first place, having to repair your toilet is going to be inevitable sooner or later. It is one of the most used items in your house and you will have to maintain it regularly to make sure that it is always working properly. The best toilet repair kit guarantees that you will be able to take care of any problems you are facing with your toilet. Regular maintenance and fixing the little problems is going to save you a lot of cash in the long run. It is advised not to ignore any problem related to your toilet before it turns into something serious that can affect other parts of the house. 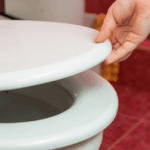 This article is written to help you pick the right repair kit for your toilet. Make sure that you browse our list before making a purchase. Which product should you buy? This is a question that definitely crosses your mind when you are shopping for a new repair kit. If you are not a professional plumber, then you will probably check toilet repair kits ratings to make sure that you’ve picked a reliable one. We’ve done the job on your behalf and reviewed 7 of the best-selling products on the market. Check them out to pick the one that you suits your need. This kit includes everything you’ll ever need to make your old toilet run like new. It is one of the most popular kits on the market because it is very easy to use and can be used to fix different toilet models. It comes with all the parts needed to repair your flapper and valve including the O-ring and the necessary sealants. It is a great value for the money because you won’t need to buy anything else. All the parts are made of a high-quality material that is resistant to bacteria and mold growth. 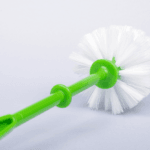 The parts are coated in Microban; a chemical coating that prevents the growth and spread of harmful bacteria that can cause a nasty smell in your bathroom. Moreover, the material is resistant to chlorine and other city water treatments that usually affect cheaper replacement parts in the long run. If you have hard water, then this is a great kit to buy because the fill valve comes with a filter that guarantees that everything will work properly. If you have a 2-inch valve then you definitely need to get this amazing repair kit as it comes with easy-to-read instructions. Affordable universal repair kit for different toilet models. Comes with all the parts needed to fix the flapper and the valve. Parts are resistant to bacteria. High-quality parts to resist chlorine and other chemicals. Whether you have a noisy or a slow filling toilet then you need to think about buying this universal toilet repair kit. It is designed to fix all new and old models to keep your toilet working with no problems whatsoever. This is a great product for easy and quick fixes because it comes with all the parts you will need to deal with a problematic toilet. 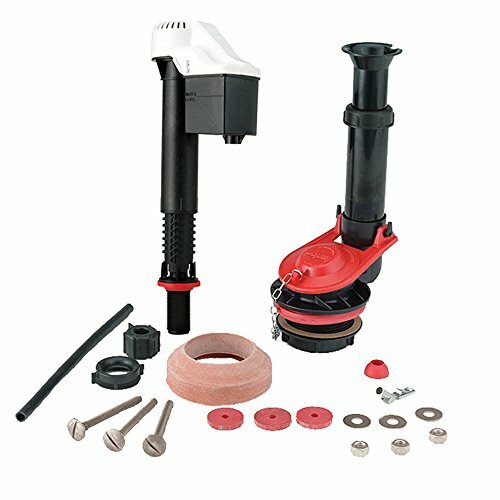 Using this kit is going to help you upgrade an old toilet that doesn’t flush or runs all the time, without having to endure the cost of installing a new toilet that costs hundreds of dollars. It comes with high-quality and durable parts that will resist the growth of bacteria and keep your toilet clean of nasty microorganisms. The parts are made of sturdy material that doesn’t deteriorate with continuous exposure to chlorine. They are easy to install thanks to the easy-to-read instructions so you don’t have to worry about hiring a professional plumber. Universal toilet repair kit to upgrade your toilet. Works on new and old models. Sturdy materials that resist the growth of bacteria. Affordable alternative to installing a new toilet. If you are looking for a high-quality repair kit then you need to check this one out. It is going to fit different toilet fill valve types because it is adjustable. This is a good choice for most toilet brands and it is quite affordable. This is a great kit to maximize your toilet performance and save water. If you have a toilet that keeps on running or doesn’t flush well, then this is a good choice. It features an automatic shutoff that guarantees that you will be using less water to flush your toilet properly. Whether you have an old toilet or a high-efficiency one, you can depend on this kit. Replacing your valve takes a few minutes and it is going to last for long. You can also do the regular maintenance on your own as it is quite easy to use. Great repair kit that can fix old and new toilet models. Automatic shutoff to prevent unnecessary water consumption. Adjustable height to suit different toilet valves. Quick installation and guaranteed performance. If your toilet doesn’t work properly, then you need to buy this all-in-one kit. The seal has a hidden wax ring that prevents leaks and is 3 times stronger than a regular one. This guarantees that everything will work properly. If you wish to avoid the mess of removing extra wax then you should pick this product. The rubber gasket keeps the wax secured in place to avoid clogging. It also keeps the sewage gases entrapped so that they don’t contaminate the air in your bathroom. No cutting is needed thanks to this no-mess design. The durable bolts are made of stainless steel and brass and are adjustable to fit different heights. The sliding adapters allow you to tighten the bolts easily and the caps are perfect for fast lock and release. 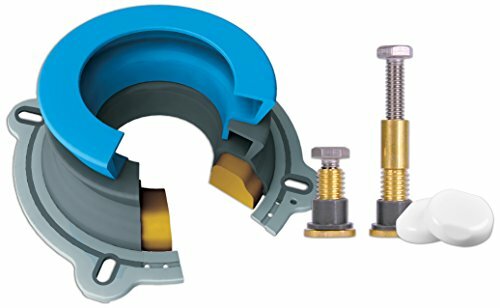 The flange can fit a toilet that is ½ an inch below or above the floor. This is a great kit that you can use to fix a leaky toilet without damaging the floors. Easy to install kit that suits different toilet models. Hidden wax ring that prevents leaks. Adjustable bolts that can fit different toilets. Perfect rubber seal that keeps the sewage gases entrapped. This kit contains everything you need to make sure that your toilet is working the way it should. It is a great choice for people who prefer to do things on their own to save money and time. 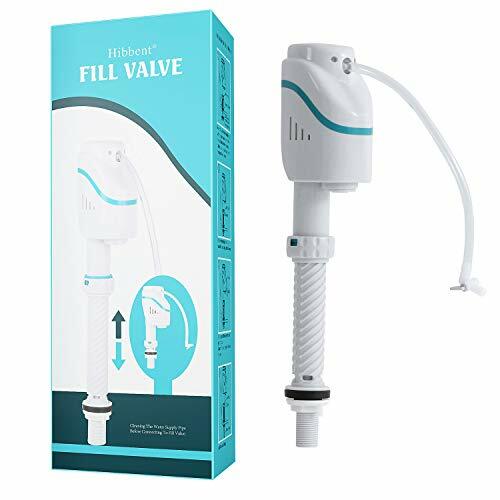 The adjustable anti-siphon fill valve will guarantee that your toilet will flush properly as it comes with a durable float. The flapper and the chain are made of durable materials that don’t deteriorate with everyday use. The height is adjustable to fit different toilet models. If you don’t want to hire a plumber to fix your toilet, then you should invest in this high-quality kit. It has an automatic shutoff the prevents the unnecessary filling of water to save money on your energy bill. Say goodbye to a toilet that doesn’t fill fast or flushes slowly. It guarantees that your toilet will work silently and properly. Don’t worry if this is the first time you take matters in your own hands because your toilet repair kit is very easy to use. Durable materials that fit different toile models. Automatic shutoff to prevent the unnecessary use of water. Adjustable to fit various toilets. 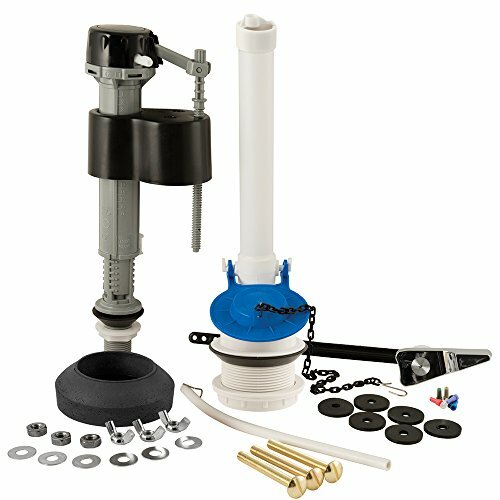 This is a comprehensive repair kit that can successfully upgrade your old toilet. 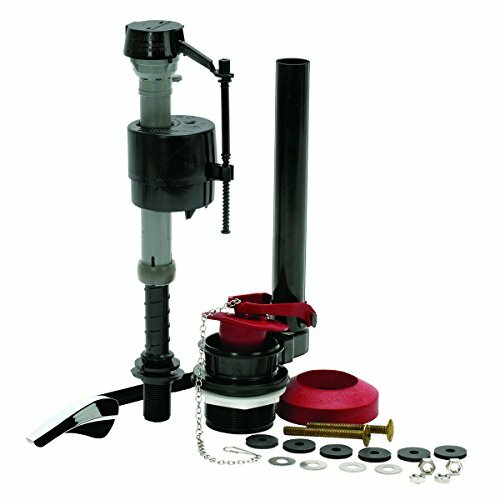 It contains all the parts needed to repair your toilet including the fill valve, flush valve, water saving caps, and flush lever. If your toilet is malfunctioning then you should buy this kit because it will help you overcome and fix all the problems for an affordable price. The kit is going to help you save on water consumption as it comes with 7 coded pieces. The coded water flow adjustment caps can help you save up to 40% of your water consumption. Every kit comes with all the needed instructions that you need to fix your toilet problems. The components are made of long-lasting and corrosion resistant materials that will last for long. The bolts and valve can be adjusted to fit different toilet models to guarantee the best performance. Universal kit to upgrade the performance of your toilet. Adjustable pieces to fit different models. 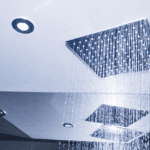 Can save water consumption up to 40%. Long-lasting pieces made of corrosion resistant materials. When you have an expensive toilet like a high-quality model made by Kohler, you want to make sure that you are always using the best plumbing replacement parts. 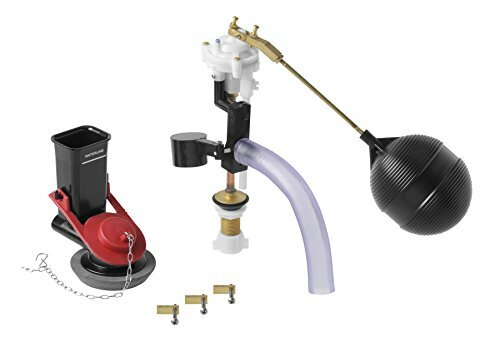 This kit includes the parts that you need to maintain the performance of your old Kohler toilet. It is more expensive than other universal kits but it is the only one that contains genuine Kohler parts. If your old toilet has started to malfunction, then buying this kit will help you replace all the old worn parts. Buying a new toilet is an expensive option but this kit is going to make your old one work as good as new. It includes the fill valve, flush valve, flapper, and gaskets. Whatever is wrong with your tank, this kit will contain the right part to fix it. 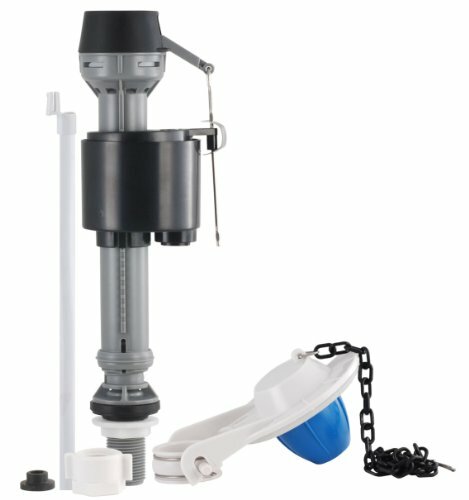 It is compatible with older one-piece models and is going to help your toilet run and flush properly. Original Kohler parts to maintain one piece models. Includes several replacement parts to fix various problems. Boosts the performance of your old toilet. 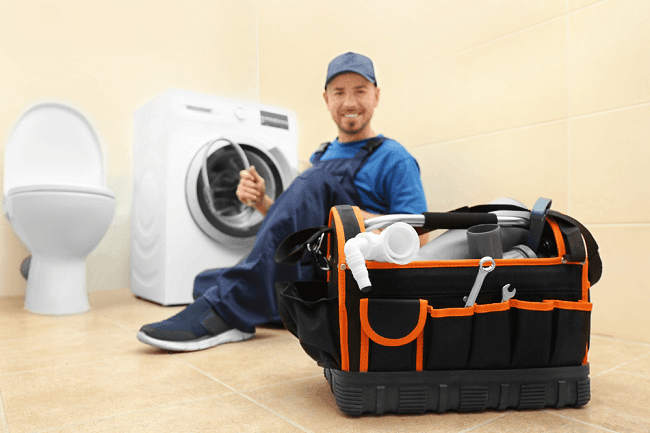 How to Choose the Best Toilet Repair Kit? Although there are a lot of excellent repair kits on the market, only a few of them can work to fix the problems of your toilet. A toilet that keeps on running or doesn’t flush properly is going to put a toll on your water consumption bill. 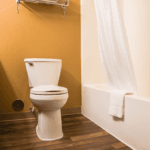 Here are a few tips to consider while shopping for a toilet repair kit. It is always a good idea to buy a kit that contains all the necessary parts that you need to fix your toilet problems. Some kits even come with the bolts that you need to fit the spare parts. When all the parts belong to one kit, it is more likely that they are going to be compatible. They will boost the performance of your toilet and help overcome any problems related to filling or flushing. Buying a kit that contains everything is also going to cost less than buying each part separately. The parts that make your toilet work are always submerged in water and subject to corrosive materials. It is a good idea to buy a durable kit that contains high-quality parts. These parts should be designed to resist corrosion and prevent the growth of bacteria. Buying the exact original part that broke or doesn’t work in your toilet can cost a lot of money. The cost definitely goes up when you have to replace several parts to fix a lot of problems. If you are buying a universal kit that fits several toilet models, you should make sure that you are able to adjust the valves and bolts. This is the only way you can guarantee that your replacement parts will help fix your toilet. You need to make sure that you are able to install the new part on your own. If you are in a hurry and need to save some cash, you are going to need a reliable kit that comes with easy instructions. Hiring a professional plumber means that you are going to endure extra costs that you are typically trying to avoid. Before you set your heart on the best toilet repair kit, you have to make sure that it contains the right piece that can fix your problem. Check your toilet for various issues and pick a reliable kit that can fix these problems. Most of the high-quality packages include all the needed parts that can help boost the performance of your old toilet, but you need to check the components especially if your problem is more specific. You also have to make sure that the parts are compatible with your toilet model to avoid spending unnecessary money. Browsing our article is going to help you choose a reliable kit that won’t let you down.